A look at an Arctic animal often overshadowed by its showier predators: polar bears and orcas. 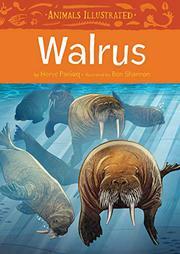 Young readers will learn the basics about walruses here: adaptations, young, social groups, feeding, anatomy, range, predators, dangers to humans, and Inuit use of walruses for meat and ivory for their harpoons. Paniaq focuses on a different topic on each spread. This makes the sometimes-lengthy text manageable for younger readers, especially considering the fascinating facts he salts throughout: walruses can feed for up to 79 hours straight and can eat thousands of clams in that time; a walrus’s hide is covered in tiny hairs except for its flippers. Though some terms are defined in the text, younger readers might wish for a glossary, and there is also no index. Shannon’s illustrations are quite lifelike and include a helpful silhouette of an adult human beside an adult walrus (a dramatic difference in bulk that figures alone can’t quite capture), a labeled skeleton, and close-ups of the skull (with tusks), whiskers, and flippers.